The request for a Koh Phi Phi weather forecast is common but fraught with problems. As Koh Phi Phi is a small island, it is easily influenced by weather from the neighbouring regions. The 2 large land masses are Phuket island 48km to the west and the Krabi Province 54km to the east. Koh Phi Phi weather forecast is mainly influenced by the monsoon in the low season, June and September and from the Thai mainland in high season. The main 5-6 weekly monsoons happen in June when the sun heads north and then in September when it returns south. With the sun directly overhead it creates low pressure and strong wet winds. Normally you would forecast 5-7 weeks centred on the 15th June and 15th of September and the weather to be poor for tourism. This unsettled period is not all day every day but when the low pressures come through the region you might get 3-4 days of storm. In between any storms there will still be a wind from the west, strong hot sun and the most excellent visibility. The ferries to Koh Phi Phi are rarely effected even though there can be large waves between Koh Phi Phi Ley and Koh Phi Phi Don. 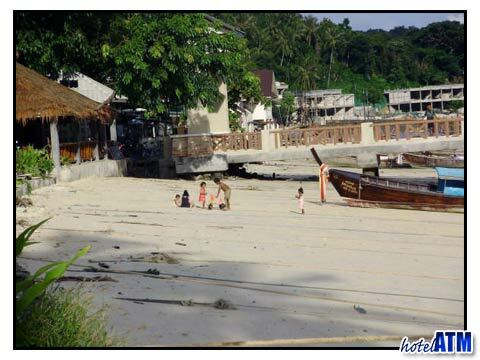 Koh Phi Phi Don village is still busy as many people take full use of the Phi Phi Hotel deals that can give you upto 40% off high season rates. The diving trips and the spas at the luxury koh Phi Phi Resorts of Zeavola Phi Phi Resort, Holiday Inn Phi Phi Island, and Phi Phi Island Village Resort And Spa are busy while the rain comes pouring down. 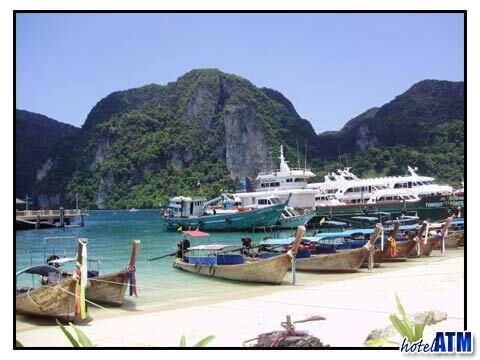 Koh Phi Phi weather forecast in the high season is more dominated by the heat and convection clouds created over the Krabi mainland, especially the Khao Phanom mountain range. These weather convection cycles tend to send the winds south east and are received at Koh Phi Phi as a north easterly. Later in the season these convection clouds effect Koh Phi Phi with amazing starry night skies and electric storms even though no rain is anywhere to be found. As the monsoon pressures start to take over, these clouds build and get closer to the island until, and about Songkran festival, they spill over, and the first rains arrive. The Koh Phi Phi weather 10 day forecast gives you a good idea of what local weather systems are influencing the islands. The predicted rain radar on this page is especially useful in low season and can help you plan your time on the island. Ferries, resorts, hotels, hostels, tours, restaurants, shopping clubs, pubs are open all year and are not effected by the Koh Phi Phi weather.